I started this day bright and early (7:30!) in the Flower District, making decisions about flowers with BM's friend, who helped with the flowers and shall be called floral friend (or FF) from this point on. Yes, I had planned on doing all the flowers by myself but when everyone told me that I was crazy, my BM enlisted the help of her friend who's done flowers for friends' weddings before. So I still had a pretty active, hands-on role with the flowers but I didn't have to do the extra complicated stuff and there was someone there to guide me on what to do -- a good compromise in the thick of wedding craze. Anyway, FF and I had met up two weeks prior at the market to see what's in season and to take note of prices. 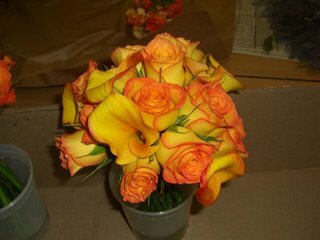 I told her that my budget was $300 (I purposely undershot this figure, knowing that I'd go over), that I wanted a fall color palette (specifically orange, red, yellow) and that I'd like callas in my bouquet. 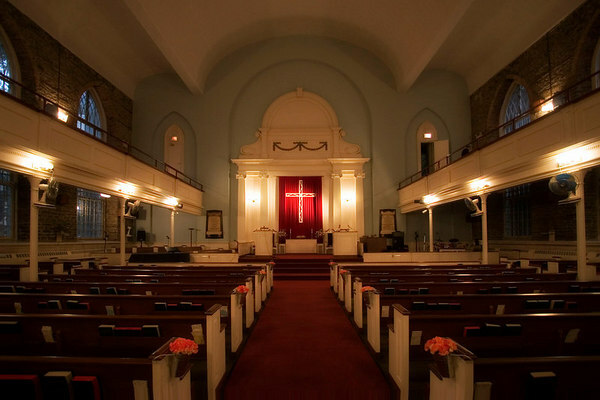 I also told her about the arrangements that I wanted for the church, which would be moved to the banquet hall later on, the corsages for the mothers, and all the boutonnieres. So the Friday before the wedding, we rushed around the various crowded shops to get choice picks (7:30 is right in the middle of the primetime -- towards the end of our stay we were sorta scrambling to get nice stuff). 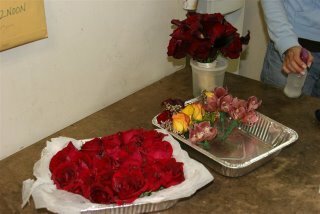 FF had already set aside some flowers she saw (she got there a little earlier) and I approved this bunch of roses from store 1 vs. roses from store 2, etc. 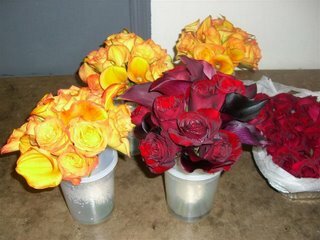 In the end, we got 1 bunch of deep red roses & 2 different types of red callas for my bouquet; 2 bunches of yellowish-orange roses and 2 bunches of yellowish-orange callas for the BMs' bouquets; 2 bunches of red roses for relative boutonnieres; several bunches of orange, orange/yellow, yellow/red carnations for the pews; 1 stalk of lavenderish-red orchids for the corsages; 1 bunch tinted euculyptus, 2 bunches wax flowers, 1 bunch lavender, and 1 bunch Japanese hydrangea for the church steps arrangements. All this went over my meager budget but still came in under $500. At the flower market, once you pick out the flowers, you get a bill from one of the workers who prices everything for you off the top of his head (I think there's some scamming going on there). Then you bring the bill to the counter to pay while some other guys wrap everything up (somewhat neatly) for you. Some places take credit card but some don't and at one of the places we had to pool all our money together to get what we wanted. 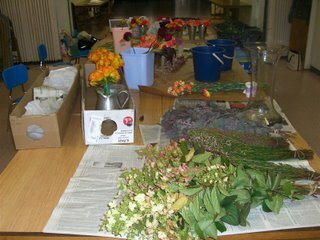 After buying all these flowers (heavy and bulky, but fit in the car), we headed down to the church where we could start arranging things. 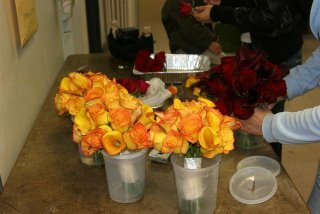 We got buckets of warm water to let the roses drink and bloom, and we prepped them by removing thorns, outer petals and leaves. 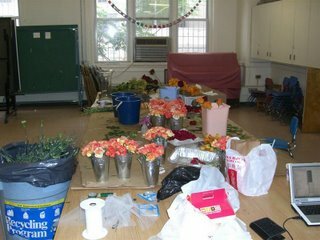 We also started to arrange the carnations for the pew buckets while FF started working on the bouquets. 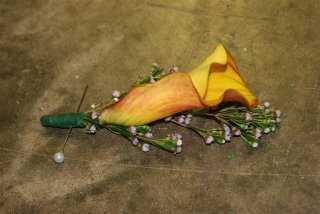 FF also showed us how to make the relative boutonnieres (just a simple red rose) by snipping, taping, and sticking a pin through. 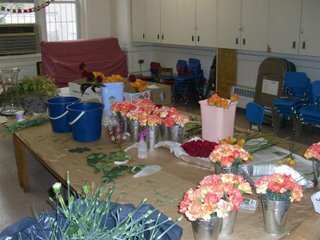 With the help of 2 BMs and a friend (Dear also helped prep the roses and cut the floral foam to fit the buckets), we were done by lunchtime. 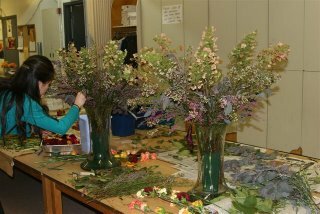 At that point, FF continued working on the bouquets (she had done 2 BM ones already; I think and they were so lovely!) while I went with a BM to the friend's place to do our nails. 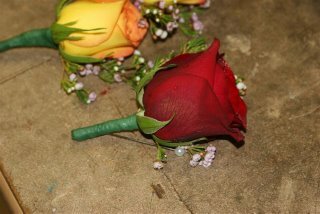 Sometime between this and the rehearsal, BM's sister went and got a bunch of cheap roses for the petal toss at the end of the ceremony and an ad hoc tablecloth for the sign-in table at the church. 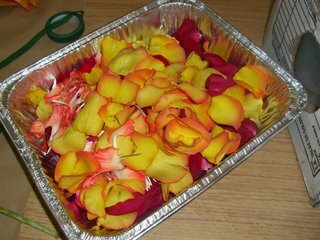 The outer petals we pulled off the roses, plus some of the carnation petals for good measure. 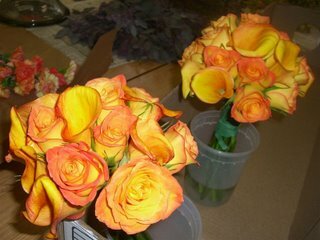 A word of caution/tips for DIYers who would also go to the Flower District to buy flowers -- I think the prices are more flexible than you would think so I think there's room for bargaining, especially since a lot of the places only accept cash when you do not have a business account with them. I, however, was too chicken and bewildered to do so myself. I also sensed some shady business dealings and overall I thought it a shady business that there are no displayed prices, just some guy who quotes prices from his head (as I mentioned above). And FF said 2 different ppl at one store quoted her 2 different prices. 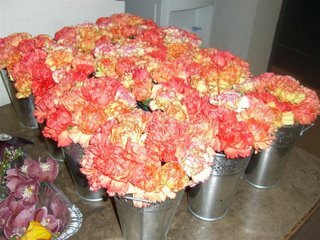 Also, you should buy a little more than you think you need b/c some of the flowers were already damaged when we opened them up (we also did some damage as we worked too). 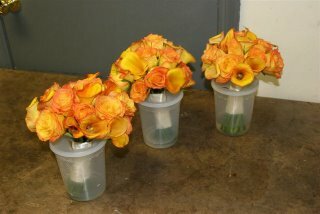 The pretty bouquets sitting in plastic takeout containers, ready for safekeeping for the next day (note the notches cut in the covers to keep the bouquets standing straight in the water). 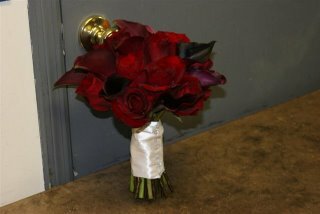 My bouquet, decorated with ivory double-faced ribbon and round pearl-head pins. 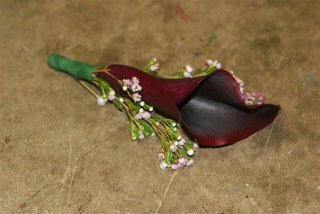 See how the relative boutonnieres opened up so much -- I think more of the outer petals should have been removed. I wanted Dear to have double callas but the market didn't have any mini callas so 2 of the regular-sized ones would have been too big. 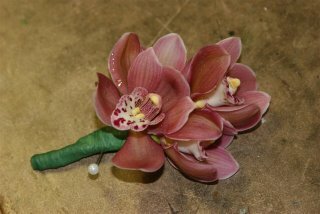 Originally FF wanted to order cattleya orchids (just one big one) but the price we were quoted was way expensive and I'm kinda glad b/c these turned out well and there were also leftovers to use for my hair in the evening. The one stalk of orchids we used was either $10 or $15 (don't remember). 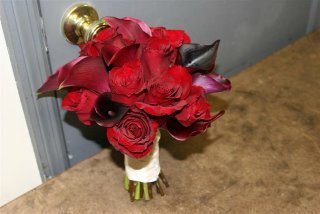 In retrospect, I think the GMs should have had the callas to match the groom and the fathers should have had the roses. FF putting the finishing touches on the Japanese hydrangea arrangements for the church steps (we could have used more flowers for the large vases -- I didn't know how they'd sit in the vase -- but I think FF did a good job of filling them up with what we had). The ingredients for the tall arrangements from left to right: Japanese hydrangea (I wish we got the longer stemmed ones b/c the vases were a lot bigger than we thought but so pretty on their own too! 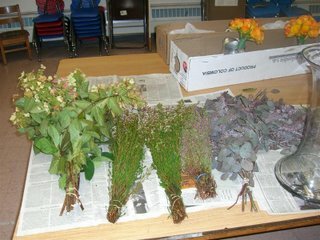 ), wax flowers, lavender, tinted eucalyptus. We got the hourglass-shaped vases from the clearance section in Target for $20 each, which are totally reusable (just have to figure out where). They are huge, about 17" tall I think, with a wide mouth, which made it difficult to fill in with a limited budget. The flowers for this part were less than $100. 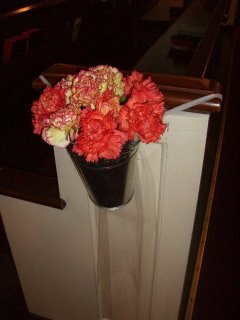 Our rendition of the pew buckets a la Martha but way cheaper, using about 12 stems of carnations for each bucket. 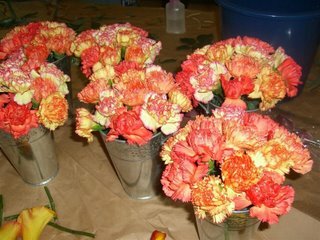 With a bunch of 25 carnations for $7.50, this was a lot more economical than using hydrangeas. I think they were just as lush-looking and maybe even nicer than Martha's, since they were such bright colors and fit in with my color scheme. The buckets were purchased from Wal-Mart for about $1.50 each (we bought 12), 2 packs of floral foam were about $6 (I think), and we hung each with tulle (part of a 1000' roll that we used for the favors as well -- purchased from AC Moore using a 50% off coupon for a total of $5, I think). 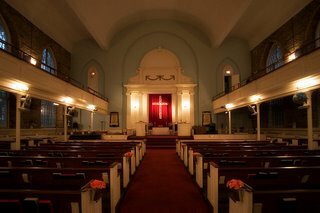 Once the buckets were hung on the pews, we added some water into the buckets. 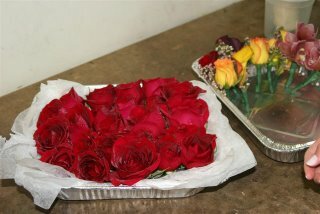 The cube of floral foam stuffed into the bottom to hold the flowers in place also helped to keep the flowers hydrated. OK, so I worked on the flowers a little too, so it's like grading myself here but I have to say FF did a phenomenal job. 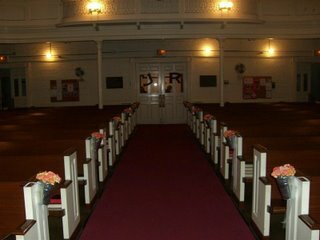 She doesn't do flowers professionally but I did pay her a little something and I have to give credit where it's due -- she went above and beyond what I expected (she said she'd work on the bouquets only and just show us how to do the other stuff but she ended up also putting the finishing touches on the stuff we worked on, plus the church step arrangements which turned out to be quite a challenge). She was very organized and did a good job with the limited budget I gave her (I changed relative boutonnieres to roses instead of carnations at the last minute so I'm sure we would have stuck to the budget even closer if I hadn't made that change). She also thought of solutions I wouldn't have, including coming up with a variety of flowers for my hair for my second dress (the flower we saw at our first meeting weren't available on the actual day we needed them). 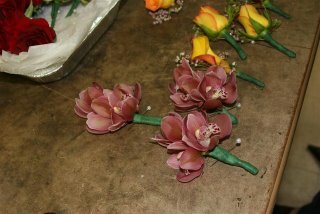 I also thought the bouquets came out beautiful (though I'm surprised they didn't come out as nice in pictures), the groom's, fathers, and GM boutonnieres were nice too, as well as the mothers' corsages. 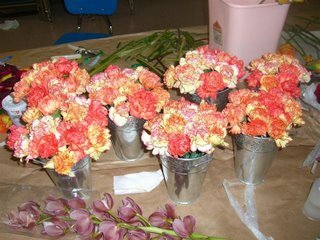 When I saw all the completed flowers, my stress level definitely declined a few notches at their gorgeousness. I'm not sure if FF would be interested in future work but if anyone is interested, I could definitely forward her your info. The A grade is well deserved. Until reading this post, I had no idea you went the DIY route for the flowers. 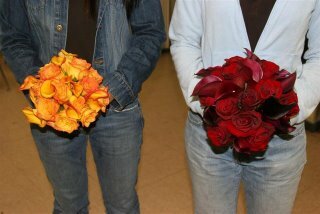 Even for our small wedding, our floral expenses were more than doubled yours (in 2001 dollars!) and our floral decorations were far more modest. Hey, I don't know if your friend would be interested in helping me out with flowers, but if she would I would love her contact info. 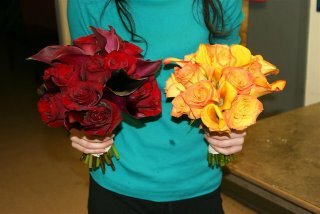 Your bouquets are just gorgeous and what I am looking for! I'm not sure what her schedule's like, but I can certainly pass along her info to you. Can you send me an email at rm47of450 at yahoo?